Hi everyone! Today is the first day of the My Favorite Things December release countdown. This release is packed with amazing new products! You’ll love them! The new products will officially be available on the MFT online store on December 8th at 10pm EST (= Europe: December 9th at 4:00 CET). For the first card, I colored the cute elephant with Copic markers. I made the background using water-soluble inks that I smooched in the paper multiple times. 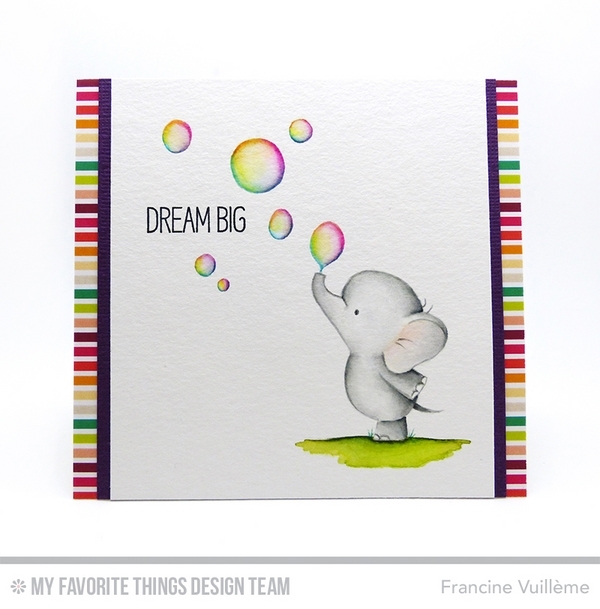 For the second card, I used the NO-LINE COLORING technique and I colored the elephant with water-soluble inks and watercolors. I drew the bubbles with a pencil and I colored them with watercolors, markers and inks too. For more inspiration, you can also check my MFT Gallery on Pinterest! Thanks so much for stopping by and see you tomorrow for more countdown fun! Love both of your cards! Your no line coloring is awesome! Perfect Valentine! Love red coloring! Can you show us how to make bubbles? Yours are amazing. Those multi-colored balloons look so cool! Beautiful cards! 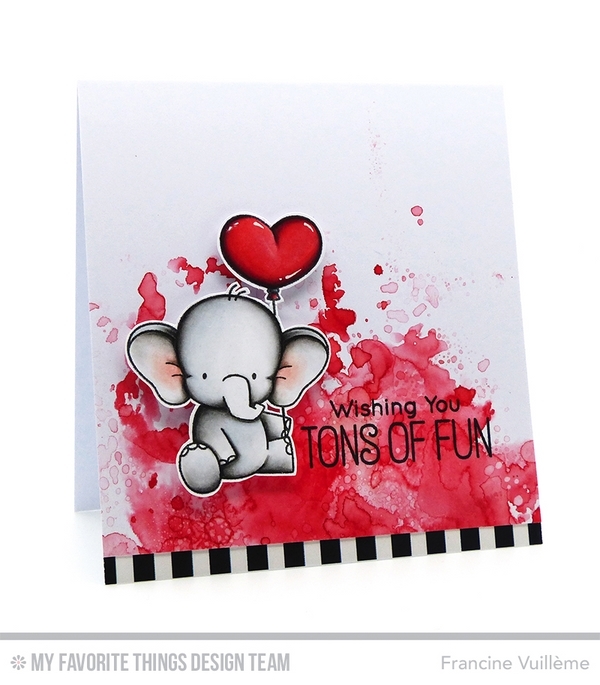 Adorable cards and elephant. Your bubble coloring is stunning ! ! Absolutely Beautiful. Love this elephant image. You showcased is Beautifully! Your cards leave me speech-less ... not an easy accomplishment, I can assure you! Great coloring, adorable designs, just wonderful. These elephants really are adorable - definitely going on my shopping list! You did a fantastic job on coloring everything. I love your colored bubbles. They look fabulous. OMG AMAZING! I love the red! Wow ! Francine Tes cartes sont superbes !!!! Love your no-line water coloring! These are AMAZING, love the coloring on the 2nd card, WOW! Beautiful cards. Love that red background. Oh my word, those bubbles, Love!! Fantastic cards! Love that red background! love your work! Those bubbles are wonderful! I'm stunning with your first card, is awesome! both cards are so beautiful! The first card is so cute! And the rainbow bubbles on the second are just amazing! C'est trop trop beau! deux vraies merveilles! tu as vraiment un don, c'est incroyable!